Heat broiler. Combine breadcrumbs and Parmesan in a shallow bowl. Season both sides of chicken with 1/2 teaspoon salt and 1/4 teaspoon pepper. Dip chicken in the beaten egg, then dredge in breadcrumb mixture, turning to coat both sides. Spread tomato sauce onto the bottom of a 10-by-15-inch baking dish. Heat 2 tablespoons oil in a large nonstick skillet over medium heat. Place 4 chicken cutlets in skillet; cook until golden, 1 to 2 minutes on each side. Using a spatula, transfer browned cutlets to baking dish, placing them on top of sauce. Repeat with remaining oil and cutlets. 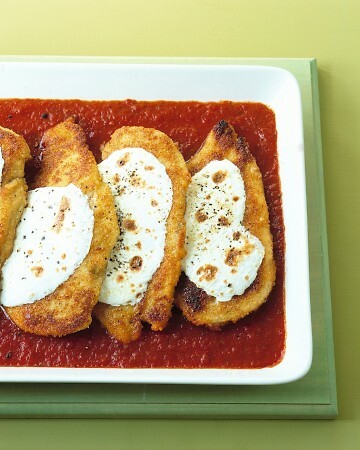 Top each cutlet with a slice of mozzarella. Broil about 4 inches from heat source until sauce is hot and cheese is melted and lightly browned in spots, 5 to 8 minutes. Serve immediately.